The Test in Hampshire is one of the most picturesque rivers in the UK. 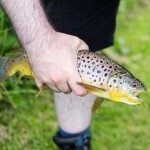 It’s crystal clear chalk streams meander through pretty villages of thatched cottages and are regarded as some of the very best for fly fishing in the country. As we both had a few days holiday to use up, J and I decided to take the opportunity to visit J’s cousin Hetal and her partner, Viktor, in Stockholm, Sweden. Neither of us had ever been to that part of Europe before, so we were really looking forward to seeing the guys and sampling a little Swedish hospitality.